There is a good chance that whatever you are doing on your PC right now (apart from reading this), Bill Gates had something to do with it. He is one of those geniuses’s that appear every decade or so and create something amazingly useful. His company is basically the biggest name in the computing industry. Microsoft are in every little nook, cranny and orifice of potentially every windows based computer in the world. The software used for this article is provided by Microsoft. The browser you are using is probably Internet Explorer, provided by Microsoft. Even if this is not the case, there is a 95% chance your computer is running Windows XP, Windows Vista, or for you people who forgot to upgrade a few years ago, Windows 98. All these are products of Microsoft, the head office of which is in Silicon Valley in Northern California. Microsoft and computers go hand in hand and in all probability, 90% of today’s business would not survive without the Microsoft influence. 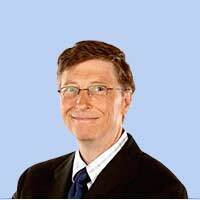 Bill Gates is actually the third richest person in the world and suffices to say, there is never a financial crisis in the Gates household! Bill Gates founded the Microsoft business with Paul Allen in 1975. He is chairman of the company, and until recently was CEO, allowing other people to drive the company after years of relentless pursuance in excellence in software and computers. Success is one thing, but the big ‘M’ became so big they have frequently been accused of being anti-competitive because they are so dominant. In other words, any software company with new ideas would be beaten down by a better version from Microsoft, or implemented in such a way that consumers had no choice but to buy their version. Some cases actually went to court and they lost, but it has not affected their dominance in the software world. Bill Gates was born on October 28th, 1955, in Seattle, Washington to William H. Gates, Sr. and Mary Maxwell Gates. The family have a history of success and high flying careers. His father was a prominent lawyer, and his mother was a board director of First Interstate BancSystem and the United Way. Gates grandfather J.W. Maxwell was a national bank president. Bill’s parents had a career in law in mind for him, but what would have happened in the computing world if had become a lawyer? It’s anyone’s guess. One things for sure, he probably would not have been the world’s third richest man today! So how did Bill Gates come upon such success and power? After flying through school, he enrolled at Harvard College in 1973. He achieved amazing IQ scores of 170, roughly one in a million level! Throughout all his schooling his obsession and interest in computers continued. He wrote programs in LISP, FORTRAN and machine language. At the age of 17, Gates formed a venture with Paul Allen, called Traf-O-Data, to make traffic counters based on the Intel 8008 processor. Further down the line, Gates developed the BASIC language, which was an interpreted computer language. An interpreted computer language means that commands are checked line by line for correctness, and if a command is wrong the computer informs the user. Following a partnership with IBM computers, and the development of the first DOS operating system things really gathered pace. Microsoft was formed, Windows for PCs was created, and basically the rest is history. Microsoft continues to dominate, and it all started with a little known genius from Seattle, Bill Gates.